The Manufacturers Identification Code (MIC) consists of three characters (block capitals or numbers) forming the first three characters of the HIN, as issued by Coast guard. It identifies the plant of manufacturer and is unique to whom it is issued. Characters four through eight of the HIN are the individual hull serial number which is defined by the manufacturer. No two boats are assigned the same hull serial number. 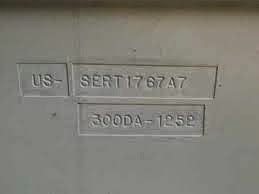 The hull serial number consists of capital letters of the alphabet or Arabic numerals or both, exceptions being the letters I, O and Q, they are not used. The country Code is an optional addition to the HIN. Manufacturers of boats have the option of adding the prefix, e.g. "US-" (block capitol letters and hyphen) in front of the HIN. This is a mandatory requirement for manufacturers exporting to some countries (for example: the European Community). This is not part of the accepted mutual recognition of Hull Identification Numbers between Canada and the US. The HIN is permanently affixed into the hull, hull member, or on a plate so that removal of the HIN or plate would normally cause some scarring or damage to the surrounding hull area. No character of the HIN is to be less than 6 mm (1/4 inch) in height and width. Where is the HIN located? * The transom above the load water line (preferably on the upper starboard quadrant). * The starboard side at the aft end of the hull that bears the rudder or steering mechanism, if the boat has no transom. * The outer most starboard side of the after end of the hull, if the boat has more than one hull, and no transom. Some manufacturers have added additional characters after the HIN separated from the HIN by a hyphen. 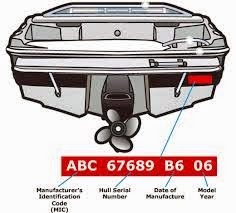 Three different HIN numbering systems have been used by the Coast Guard and boat manufacturers. Most builders started using this format in Jan 1985 and is still in use. Character Eleven - are the last two numerals which represent the model year for which the boat was built. Most builders used this format from the mid 1970's until Dec 1984. However, some builders still used the previous system. Character Ten and Eleven - are the last two numerals of the model year, which commences in Aug of the preceding calendar year. Most builders use this format from the 1960's though until the mid 1970's. Some builders converted to the newer system earlier. Characters Eleven and Twelve - are the last two numerals of the calendar year. The date of manufacture is the month and year during which the construction or assembly began. Using the "Model Year" option, the date of manufacture code for Dec 1975 would be displayed as 1275. If a HIN area is damaged a replacement code can be imprinted in the hull, the manufacturer will send a replacement HIN mold, but it must be returned (I have received them by armored car). The HIN should be inspected on any boat you have or may purchase, it must be accessible for law enforcement to inspect if you cover the HIN you must provide access to the original area. The HIN is placed in several locations on the hull and deck if you see that the number does not look factory finish you can contact the builder for more information on were to locate another HIN area so you can confirm that the boat is not stolen or being fraudulently represented. The HIN is a number you should have on hand at all times as it can be used to gather the original build information for the boat. All information that the manufacturer has on file for the boat is kept using the HIN.